While the inauguration was dominating the conversation and star-studded premieres were taking place all over Park City, a trio of really interesting documentaries premiered this weekend, including one of the most inspirational of the festival and a piece that reminds us that terrorism can be home-grown. When Simon Fitzmaurice premiered his short film “The Sound of People” at Sundance in 2008, he couldn’t have possibly imagined that he’d be the subject of a documentary feature at the festival almost a decade later. And yet shortly after that premiere, he was diagnosed with MND (Motor Neuron Disease). He was only 34 and his wife Ruth was pregnant with their third child. He was given three to four years to live and told he would lose all control of his muscles before he died. He is not only still alive, but he recently directed a feature film (“My Name is Emily,” getting a release stateside next month) using only his eyes to communicate via a computer. Simon’s story is told in the incredibly powerful “It’s Not Yet Dark” through the writer/director’s own words, captured from a memoir of the same name and delivered by Colin Farrell. The fact that Fitzmaurice is a writer at heart lends the film a poignancy and truth that wouldn’t otherwise be there if director Frankie Fenton had to rely on someone else’s words or merely those of the wonderful people he interviews, including Simon’s fantastic wife and family. Fenton also knows how to visually capture Simon’s saga, which isn’t always easy with human inspirational stories like this, but he has a strong, poetic eye. Ultimately, what makes “It’s Not Yet Dark” so remarkably powerful is the open-book honesty of its subject and those he loves. Ruth is such an honest, well-spoken, interesting woman. Many people will walk out of the film praising Simon, but this is Ruth’s story too. And it’s something relatable for all of us. When Simon says “I dance for the last time,” remembering the moments before he lost control of his muscles, that’s something that connects with the heart. Imagine hugging your kid for the last time. Imagine telling your wife you love her for the last time. And then imagine being trapped in a body that feels everything and retains all the same mental capacity but being unable to express any of it. However, “It’s Not Yet Dark” is far from a tragedy. Fenton and Fitzmaurice embrace the inspirational aspect of it all completely and unapologetically. It’s the kind of thing that could have turned into clichéd life lessons, but they resonate here. When Simon says “For me it’s not about how long you live, it’s how you live,” it’s difficult not to nod in agreement. Serving a completely different purpose that illustrates the range of documentaries at Sundance is Barak Goodman’s “Oklahoma City,” a well-researched and well-made chronicle of one of the darkest days in U.S. history. Premiering at Sundance, “Oklahoma City” opens with audio of the Water Resources Board Meeting that morning, during which you can hear the deafening explosion. 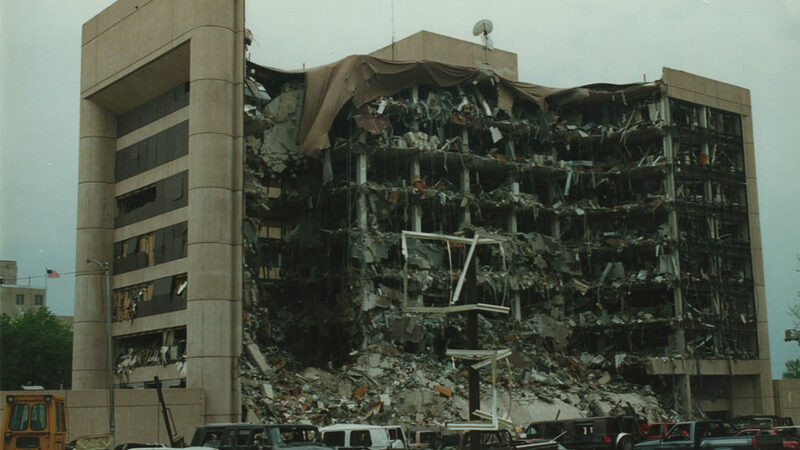 It then transitions to interviews with parents of children who were in the day care center that resided on the first floor of the Murrah Building in Oklahoma City, before Timothy McVeigh blew it up. First, a personal angle should be revealed. I was doing a college internship at a TV news station in 1995 when this tragedy occurred. I remember all-nighters filled with active newsrooms trying to get the latest details as the manhunt was underway and the death toll rose. I was actually in charge of the latter, getting the latest names and numbers, finding out details about not who did the killing but who was killed. It was a fascinating but somewhat traumatic journey in that when the memorial happened a few days later I could actually recognize many of the people in the audience and who they were mourning. It is an event I still think about regularly, almost every time a major tragedy like it—Newtown, the Colorado theater shootings—takes place. And so I know quite a bit about what happened in Oklahoma City and the background of Timothy McVeigh. I mention all of this because I could still learn from and appreciate Goodman’s film, especially the way he places everything that happened that dark day in a greater context. Of course, that context extends back to Randy Weaver and Ruby Ridge—which is given a nice chunk of time and explained in detail I hadn’t seen before—and then the line is drawn to Waco and David Koresh. There’s a term we like to use for foreign terrorists in the wake of ISIS—radicalized—but that’s what happened domestically to Tim McVeigh, who bought into the idea that Weaver and Koresh were dead in part because of their race and their defense of their second amendment rights. There’s startling footage of McVeigh at the standoff at Waco, selling bumper stickers. Goodman’s historical approach is more effective than his emotional one. He returns to the stories of dead children being pulled out of the rubble and a harrowing one about a surgeon who amputated a woman’s leg with a pen knife to pull her to safety. As manipulative as they can be, I understand the emotional desire to come back to these stories because the film could have otherwise been read as making excuses for Tim McVeigh. Goodman constantly reminds us that even though he may have had his reasons, he was a monster. And his monstrosity ushered in a new age of domestic terrorism. “Oklahoma City” is an important chapter in that ongoing struggle. While McVeigh’s story is well-known, over in the World Documentary Competition program, “The Workers Cup” offers a story most of us probably have never even considered, that of the hundreds of men who work for years to make a World Cup possible. Qatar isn’t hosting the international competition until 2022, but men have already been hard at work to build the stadiums and facilities to make it possible. Men come from all over the world—although primarily India and Africa—allowed to work in Qatar on work visas controlled by their employers. They can’t get another job. They can’t leave the country. It is essentially slavery, an impression enhanced by working seven days a week in relatively poor living conditions. All many of these men cling to is a World Cup of their own, in which the workers compete. One young man even hopes a scout will see him and change his life forever. The opening of “Workers Cup,” which hints at a film more about economic disparity and the people not often considered but essential to events like the World Cup, actually gives way to something more of a sports documentary for longer than you might think. Long highlights of games within the Workers Cup competition are shown, and there are times when the film feels stretched out by these segments. It’s the kind of piece that could have cut much of its soccer footage and might have worked better as a short. Still, it returns to its strength—the men it chronicles and their open, honest interaction with the camera. Many of these men have sacrificed everything they cared about to make money to send home to their family. We may not be able to relate to love for soccer, but lines like “It’s for the good of my children that my own life gets thrown away” have power in any language. Next Article: Sundance 2017: Table of Contents Previous Article: Sundance 2017: "The Big Sick"